Legend has it that Tuscan Archipelago had its origins when a necklace slid from the neck of Venus, the Goddess of beauty and love, and fell into the waters of the Tyrrhenian Sea. This delightful story surely holds a gain of truth, for there is no doubt in our mind that that islands of the Archipelago are truly fragments of paradise. Few other tourist resorts in the world can boast such rich and varied scenery within such a small area: the underwater terrain is the delight of scuba divers, mountains are circled by centuries-old forests, beaches and inlets are set against typical Mediterranean vegetation, and small hill towns nestle in a timeless tranquillity. There is something to suit every visitor whether it is practising their favourite sport, exploring the Archipelago in discovery of its history, culture and gastronomy or simply enjoying the sea and the sunshine. The islands have an ancient tradition of hospitality. Every holiday season, we are pleased to offer this hospitality to our visitors. We are quite sure that their first stay will not be their last. Sea, history and man have been the forming influences on the islands of the Tuscan Archipelago; they are akin to a single large casket containing all the elements for an unforgettable holiday. In this site you will find testimony to the richness of the islands' tourist attractions, so close to home yet so far away from everyday places. 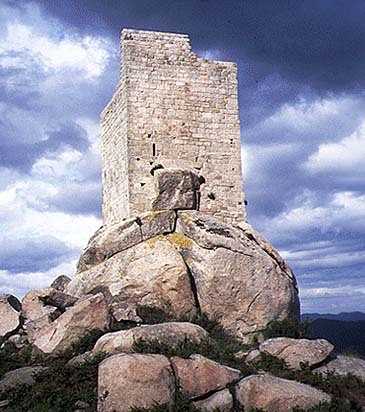 Each race of people that occupied the Archipelago in its long history left its traces: in the mines and caves of Elba; in constructions like the grandiose watchtowers of Capraia or Elba's Romanesque churches; in the shallows of the islands where exceptional archaeological relics have lain untouched for centuries. Sitting down to table means re-discovering the authentic flavours of a simple and wholesome cuisine. Many of the recipes were brought to the islands by seafares who came from Tuscany, Liguria and Campania. In fact, the islands' cuisine combines the best of these mainland traditions. The Tuscan Archipelago produces its own red, white and rosé wines. These are of fine quality and are widely available locally. The wines have good body and a distinctive bouquet - a product of sunshiney, salty sea air, and strong, fertile soil. The combination of good food and wine is certainly an excellent way to enjoy life. Elba has a typical coastal climate, rendered mild by the sea air even in winter. Rainfall is rare on the whole, especially in the summer. In the warm season the temperature of the sea stays around 20 degrees as late as October. Elba offers the authentic flavours of a simple but tasty cuisine which consists in fish dishes, vegetables and sweets, made using recipes which have taken the best from Tuscan, Ligurian and Campanian traditions, brought to the island by these seagoing people. In the Island, there are various opportunities for leisure and cultural enrichment, thanks to historical events, sporting events, concerts and village fairs, during which the old traditions are renewed in order to attract both tourists and locals. National and international Sailing Regatas find in Elba on ideal competition field (360° winds) and these are organised all year round. During spring Elba's minerals become the stars of "The Earth's Treasures", an important market-fair with exposers from all around the world. For enthusiasts and the merely curious there is the Historic Rally, with classic cars parading on the roads of Elba. The " Island of Elba-Raffaello Brignetti" Literary Prize is another important cultural event. A small literary prize with big tradition and prestige that, along its history, has revealed some great authors of international relevance. These are but a few of events of the elban season and The Councils, that compete in offering quality events, organise many more. Portoferraio is the capital and main port of the island of Elba. It is situated along the north-eastern coast on a promontory that delimits the northern side of the bay. Portoferraio is one of the oldest towns of the islands. 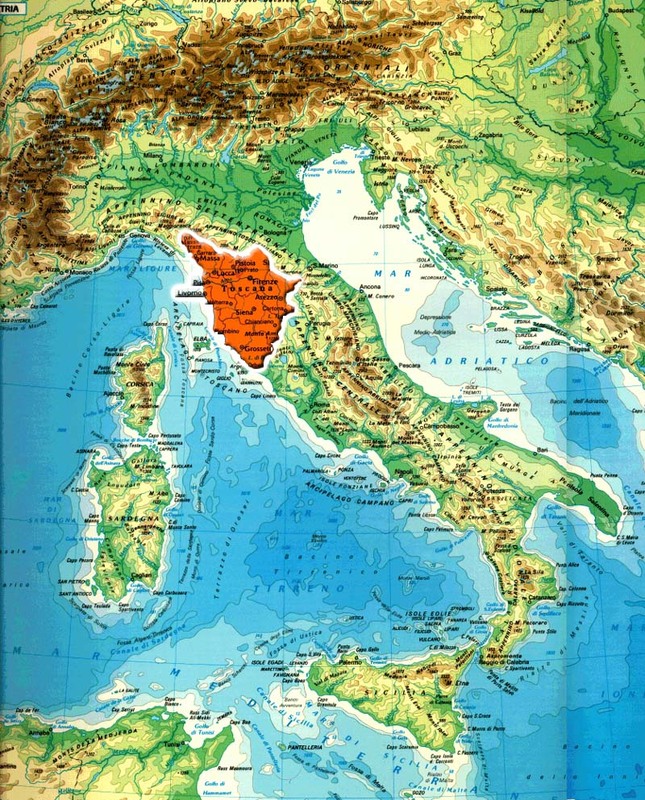 Before becoming a Roman colony, with the name of Fabricia, the town was inhabited by Ligurians, Etruscans and Greeks. The remains of a Roman villa of the imperial age can be viewed at a few kilometres from Portoferraio, in direction of Bagnaia, in the district called Le Grotte. The remains were covered by bushes until 1960, when some excavations brought back to light a large complex with walls in "opus reticulatum", large terraces overlooking the sea and a swimming pool with a water heating and purification system. Portoferraio, as it looks today, was built according to the will of Cosimo I Medici who started extensive fortification works in 1548, after renaming it Cosmopoli. In 1814 it played host to the exiled Napoleon Bonaparte. On May 3rd 1814, Napoleon landed at Portoferraio to take possession of the small reign assigned to him in return of his abdication, according to the Treaty of Fontainebleau. Napoleon resided on the island only for 10 months, leaving behind significant evidences of his short stay, though most of them were created by the imagination of the people of the island. The tangible signs of this presence are represented by Palazzina dei Mulini and villa San Martino. The former, given this name to remind of the presence of four water mills, was the town residence of the Emperor; it is located in the highest part of Portoferraio, between Fort Stella and Fort Falcone. Villa di San Martino, at 6 km from Portoferraio along the road to Marciana, was his summer residence and the present-day location of the Demidoff gallery. Other memories are preserved in the church of the Reverenda Misericordia at Portoferraio. Other historical sites are the Romanesque church of S.Stefano alle Trane, the fortress of Altura Etrusca del Castiglione, the International Art Centre of Italo Bolano, the Pinacoteca Foresiana and the Botanical Gardens of Ottone. Following the road that coasts the bay of Portoferraio, we find the Thermal Baths of San Giovanni, an area that covers about five hectares of marine muds rich in iodine and sulphur. Originally this area, where the sea is shallow, was the location of salt marshes. Now it is the seat of a modern and fully equipped spa. Treatments with sodium chloride, bromide and iodide are ideal to cure skin diseases and to rejuvenate it, for arthropathologies and for respiratory diseases. The municipality of Portoferraio also comprises the districts of S. Giovanni, Schiopparello, Magazzini, Ottone, Carpani, Bagnaia, S. Martino, La Biodola, Viticcio and island of Montecristo. To the east: Bagnaia (sand and pebble), Magazzini (pebble), Ottone (sand and pebble), Schiopparello (pebble). To the west: Acquaviva (pebble), la Biodola (sand), Capo Bianco (pebble), Enfola (sand with pebbles), Forno (sand), le Ghiaie (ovoidal pebble), Padulella (pebble), Scaglieri (sand), Seccione (pebble), Viste (sand and pebble), Viticcio (sand and pebble). The inhabitants of Portoferraio have chosen as symbol of their community the ship of Argos thus clearly linking the origins of their town to the myth of the Argonauts who landed on the Beach of Ghiaie, according to the most credited historians of Elba. Mythology and legend have often proved to be very closely though partially bound to reality. Hundred years before the War of Troy, the Argonauts, 54 Greek heroes, including Hercules, leaded by Jason, the son of the deposed king, left for Colchis in search of the legendary ram, whose Golden Fleece would have allowed the claimant to the throne to regain possession of his kingdom. The enterprise appeared to be very difficult because the sacred animal was protected by a fierce dragon and by furious bulls. Even the journey was full of perils and unexpected occurrences. According to the legend, their ship founds itself in front of the beach of Ghiaie, where the Greeks landed and refreshed themselves, after a storm. The village of Porto Azzurro was given this name in 1947, when it was authorised to change the old name of Porto Longone that reminded too much of the prison situated inside the Fortress of Longone. The town overlooks the Gulf of Mola, one of the largest inlets of the eastern coast of Elba, with a sheltered port that is the berth of boats, ferries and pleasure boats. Today, this village of fishermen and country workers is a famous sea-side resort. At about 1 kilometer from Porto Azzurro tourists can visit the Miniature Mine, a miniature reconstruction of a mine and of its activities. But there are also other historical and cultural sites, like the Sanctuary of Madonna del Monserrato and the Spanish Church Cuore Immacolato di Maria. Barbarossa and Mola are the main districts administered by the town. Mount Calamita is situated at 413 metres above sea level on the peninsula with the same name, in the south east of the island. The abundant ores of magnetite explain the popular legends that claimed that the shipwrecks were caused by the mineral that attracted the metal parts of ships, inevitably pushing them against the cliffs of Punta Calamita. It is a fact that the needle of compasses is severely affected in this area. The island of Capraia is part of the Tuscan Archipelago. Its whole territory, with the only exception of the village and the area that was formerly part of the penal colony, has now been comprised in the National Park. It is situated at 65 Km from Livorno, the municipality that administers it, at 55 Km from Piombino and at 31 Km from Capo Corso (Corsica). It covers an area of 19.26 square kilometres and is, for size, the third island of the Tuscan Archipelago. It can be reached from Livorno (two hours and a half ) and is connected by regular daily ferries. This island of volcanic origins emerged in the Tertiary Age. It has no level ground, but has a wild nature; it is divided by a mountain chain that raises up to 447 metres with Mount Castello and has indented and steep coasts with several grottoes. The village of Capraia stands on a promontory that overlooks the harbour bay. It has typical Mediterranean characteristics with small and low white houses. 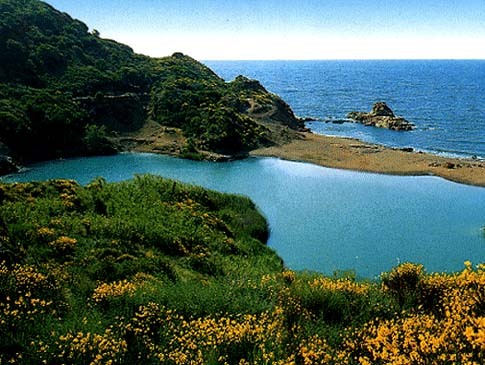 The most important tourist attraction of the island of Capraia is the small lake called Stagnone at 321 metres of altitude. This is a natural basin of fresh water that covers an area of 5,000 square metres with a depth below one metre. For many years, people believed that this lake covered the large crater of an extinct volcano. The particularly mild climatic conditions allow the island to be visited all the year round. Motorised vehicles are not allowed to circulate in summer, though there is a regular public bus service connecting the port and the village. The local co-operative "Parco Naturale Isola di Capraia" organises boat trips and farm holidays. The seafaring Greeks were the first to land there and gave the island the name of Aegylon, the land of goats. The Phoenicians, Etruscans and Romans appeared there in subsequent eras, creating the first human settlements. The historic remains from these settlements are collected in the Tower in the Port of Capraia. After the fall of the Roman empire, the island was left deserted, especially as a result of the invasions by pirates. And so, in the early centuries of Christianity, it became place chosen by hermits and anchorites. It was successively conquered by Saracens, Pisans and Genoese, who in the sixteenth century built, at a sheer height above the sea, the Forte San Giorgio. In 1873, a third of the surface of the island was used as an agricultural penal colony and made out of bounds to the rest of the population. The colony was closed down in September 1986, thus opening up the entire surface. Other places of historic and cultural interest are the church of the Assunta, the church of St.Nicola and the Sacred Heart of Jesus, the church and convent of St.Antonio, the church of St.Stefano alla Piana, the Torre dello Zenobito and the Torre della Teglia. Torre del Porto is placed at the entrance of the island of Capraia, this construction is built on a circular base. 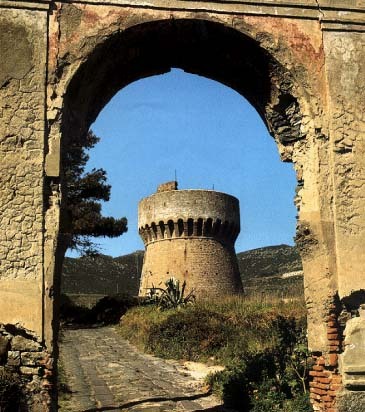 It was built in 1516 by the Genoese for defence and as a look-out post for Turkish pirates and is still well preserved. There are no "beaches" as such on the island of Capraia: there is only one small beach to be found along the wonderfully rocky coast and among the small rocky bays. This is Cala Mortola which can only be reached by sea. For those who wish to go there are two agencies that provide a boat-taxi service. Other accessible points for bathing are right below the castle, below the port tower and below the lighthouse. You can also swim from the two piers in the port, where the water is very clean, and also in the bay of Cala dello Zurletto. The Natural Park of theTuscan Archipelago was set up following a presidential decree in 1996 and it includes almost the whole of Capraia. 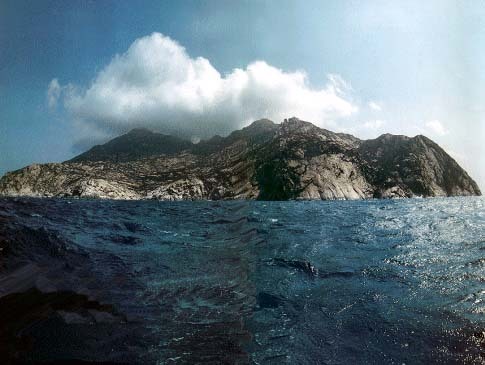 It is to be noted that apart from the stretch between Punta di Porto Vecchio and Punta della Fica, speargun fishing is not allowed; between Punta del Trattoio and Punta del Manzo both transitting and landing are prohibited, since it is a totally protected area and is to be repopulated with wildlife. The same is true for the section of pathway between the traffic light and Torre dello Zenobito.